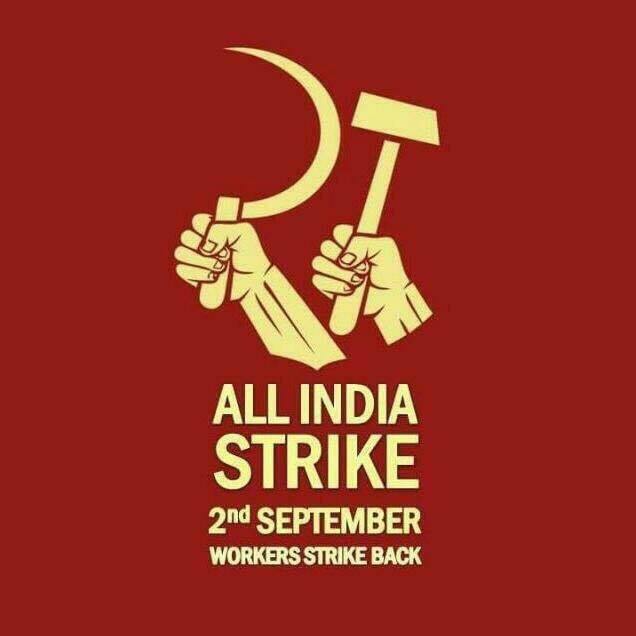 All trade union federations in India, except the BMS affiliated with the RSS, have declared a one day nationwide strike on 2nd September against the price rise and economic policies of Modi government. One of the main demands is a minimum wage of Rs 18,000/ per month. At present the legal minimum wage in most of the Aountry is less than one third of this. The overwhelming majority of workers in India work for even less than the legal minimum wage. The condition of agricultural workers is the worst. In Pudducherry the legal minimum wage for agricultural workers is Rs 1650/ per month. On the other hand, if the minimum wage is calculated to provide consumption needs of three persons for fooAd, clothing, housing, education and medical expenses, then it should be around Rs 26,000/. Clearly, the economic system in the country has failed to provide even essentials of life to the most of its working people. Indian capitalism is a predatory system which feeds on the living labour of Indian people without providing them even the bare minimum needed to survive. Everybody in a working class family has to work. It is no surprise that India has the largest number of child labourers in the world. Working parents can not earn enough to take care of their children. Capitalism in India makes super profits from patriarchy and caste system. As Ambedkar said, caste is division of labourers. It divides workers and forces Dalits to do the least remunerative and dangerous work as agricultural workers, manual scavengers, sanitation workers and in other ‘untouchable’ activities. Women workers are paid a pittance. Without their unpaid extra domestic work, working class families would simply collapse. All governments in India favour employers over working people. The Modi government however has been specially vicious in attacking workers. It has systematically degraded the National Rural Employment Guarantee scheme by starving it of funds. The proposed GST is likely to stoke the fires of already high food inflation even higher. It has dismantled the existing labour inspection system for the sake of ‘ease of doing business’. Its law on Child labour permits children to work in household units. Make in India programme is premised upon Indian labour being cheaper than global competitors. The strike call of 2nd September has broken new ground. The trade union movement so far has remained confined to the organised sector which employs only seven percent of the workforce. Workers in the unorganised sector work on contract with no job security. By making the demand for a reasonable minimum wage the main slogan of the strike, trade unions have taken an important first step towards forging the class wide unity of the entire working people. New Socialist Initiative stands in solidarity with this strike and wishes it a grand success. The road to a society without capitalist exploitation, and which honours and justly rewards the labour of working people is long and arduous. Nationwide strikes which strengthen working class solidarity are its important milestones.